first of all i would like to introduce myself. I come from Belgrade, Serbia, i'm 34 and i grew up playing likes of U.N. Squadron, R-Type and Uridium on C64, then Z-Type, Project X and Xenon 2 on Amiga 500, all the way to Jets 'n' Guns and Steredenn on PC. I'd like to present my work in progress game to you! I've been a musician and sound designer in my spare time doing mostly electronic music for the last 15 years, so i've got that covered. 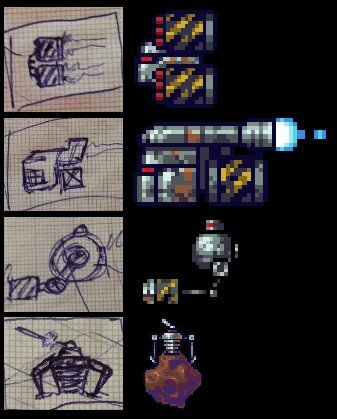 If you are interested, i run a devlog over at Tigsource forums https://forums.tigsource.com/index.php?topic=59099.msg1304758 and my website http://www.fatpugstudio.com with many interesting insights into mechanics of making a shmup. New work, what would a shmup be without lasers. The guy in the picture is Terran confederacy. The best part about gamedev is when you can relax and fiddle around with graphics. The game looks great, and there's tons of interesting stuff on that devlog.